I have an interest in foreign languages but I have to say that I’m not very good at learning them. I did reasonably well at French at school but could never really apply what I learnt. I did 5 years of French and 2 years of German, and I can speak neither if the truth be told. In early 2012 I started to learn Czech and took lessons. It didn’t really sink in and I had to stop the lessons. 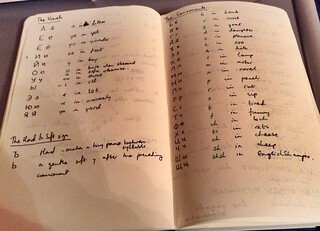 In late 2012 I started to learn Dutch and did 4 hours of the Michal Thomas course. I picked up a lot but again I had trouble applying it. The way to learn a language is to use it. The most I’ve done with Dutch is order some chicken in a Chinese restaurant in Amsterdam and a couple of beers in a bar in Sluis. Over the past 2 years I have been exposed to the Cyrillic alphabet, particularly with my travels to Sofia and Moscow. In December I decided to spend some time on Russian. In addition to my usual language barrier of actually learning the thing, I also have the barrier of not being able to read the words in the first place. My strategy is to learn the alphabet first and then try and learn some phrases. Luckily I have found a book called Read and Write Russian Script by Daphne West. Interestingly Daphne got into Russian because it was taught as an alternative to Physics at her school at O-level. The result of this early decision has led her to a degree in Russian, a PhD on Russian poetry and winning the Pushkin medal for her contributions to the teaching of Russian. The path of life is fragile – make your choices wisely. Anyway, the Cyrillic alphabet is named after St Cyril who with St Methodius created the Glagolitic alphabet which was a forerunner of the Cyrillic alphabet. It is now the third official script of the European Union – the first two being the Latin alphabet and the Greek alphabet. Cyrillic takes a lot from Greek in fact. At a first glance, the ignoramus (i.e. me) wonders why someone would write В for a V sound and Р for an R sound. The answer lies in the fact that the Modern Greek letter beta is pronounced v and the Р is similar to the Greek letter row which sounds like r. As someone who had to learn the Greek alphabet to study mathematics where one runs out of letters quickly, I have found the Greek connection a good way to remember how to pronounce Cyrillic letters (concentrating on the Russian pronunciations). I’m still not there yet… Of course, if you are a Latin only person you will have to start from scratch. However remembering some of the explanations below may help you with remembering the differences, particularly of the letters that look familiar but sound different. 1. Letters similar to Latin ones, probably because the Romans nicked them off the Greeks in the first place. The Cyrillic letter а, for example, is similar to our a and is pronounced ah or the a in father – much in the same way that a is pronounced in Dutch, German and Czech. In both Latin and Cyrillic alphabets, this letter is derived from the Greek letter alpha α. The letters are the vowels А(а) and О(о), and the consonants К(к), М(м) and Т(т). These letters are similar to their Latin counterparts, but also to their Greek counterparts Α(α), Ο(ο), Κ(κ), Μ(μ) and Τ(τ). 2. Letters that are similar to Latin ones but sound different. Е(е) – pronounced ye. It has a different sound but it derives from the Greek ε like the Latin e.
У(у) – pronounced oo and is related to the Greek Υ(υ) which is more like the Latin u.
В(в) – pronounced v. It derives from the Greek β which in modern Greek is more of a v sound. Н(н) – pronounced n as in new. Derived from the Greek Ν(ν). Go back a bit further in time – this letter comes from an equivalent in the Phoenician alphabet which looks similar to an H.
Р(р) – pronounced r as in rat but rolled. Derived from the Greek ρ.
С(с) – pronounced s as in sip. This letter is derived from a version of the Greek Σ which was more C-shaped, called the Lunate Sigma. Х(х) – pronounced ch as in loch. Derived from the Greek χ called Chi. 3. Letters that sound familiar to Latin users but look different. All of Greek origin again. И(и) – pronounced ee in feet like a European i which is how it is transliterated. It is derived from the Greek eta Η(η) and in fact was written like this up to the 13th century. Й(й) – pronounced like the y in toy and usually transliterated as a j. Active use of this letter started between the 15th and 16th centuries with it becoming considered a separate letter from И in the 1930s. Б(б) – pronounced like the Latin b and it is derived from the ancient Greek β, much like the Latin b.
Г(г) – a soft g and derived from the Greek gamma Γ.
З(з) – derived from the Greek zetta ζ, this is pronounced like the z in zoo. Л(л) – pronounced l. This is the Greek λ lambda in disguise. Actually I have trouble with this one because I confuse it with pi π because of the curly line. П(п) – pronounced p as this one is derived from the Greek π.
Ф(ф) – derived from the Greek Phi φ, this is pronounced like the f in fill. Ё(ё) – pronounced like the yo in yonder. A variation of е.
Ы(ы) – yes, it is one letter. I itself has been removed from the Russian alphabet but this letter remains. The sound does not exist in the English language but you can get there by trying a shortened i as in ill. It is derived from the combination of the soft sign Ь and the defunct Cyrillic i which was derived from the Greek iota ι.
Э(э) – the backwards e is in fact an e and similar to the Latin e, it is derived from the Greek epsilon ε.
Ю(ю) – pronounced like the u in university. Believed to originate from the Greek combination omicron-iota οι. Я(я) – derived from an older Cyrillic character called Little Yus, this letter is pronounced ya as in yard. Ж(ж) – pronounced like the s in treasure. It is not known where this letter derives from. Ц(ц) – pronounced like the zz in pizza. This letter is thought to have come from a similar Glagolitic letter. Ч(ч) – pronounced like the ch in choose. Ш(ш) – pronounced like sh and is thought to derive from a Hebrew letter. Щ(щ) – pronounced like shsh in EnglishShampoo. Derives from a Glagolitic letter. Ъ – the hard sign which for practical purposes adds a tiny pause between syllables. Ь – the soft sign which for practical purposes means that a gentle soft y is included after the preceding consonant. The letters originate in Old Church Slavonic. Here endeth the lesson. Posted in Languages, RussianBookmark the permalink.